Sweat ran down my face, dripping onto my already-soaked T-shirt. I wiped it off with a small towel hanging around my neck, but a few beads of moisture still managed to drip onto my camera. As I maneuvered my telephoto lens, my fingers left a sticky, wet film behind. Finally, I found the sun. It was now positioned so high in the horizon that I had to strain my neck each time I looked up. I invested over an hour preparing my equipment, dividing my attention between two cameras set on tripods with one hanging around my neck and a remote trigger in my left hand. Suddenly, almost unnoticed at first, crickets began chirping lightly as though readying for dusk. The warbling got louder. Faster and faster, they brushed their wings together, creating acoustical sails that amplified the noise designed to usher in night. Daylight dimmed, the air cooled, and the chirping hastened – louder and louder until, in an instant, darkness reigned. But it was only 2:38 p.m.
A woman shouted, “You can take your glasses off!” Immediately, the hypnotic crowd cheered, as they watched the moon completely cover the sun, leaving only a rim of glowing, almost fiery light peaking behind its edges, revealing the faint flicker of stars and planets. 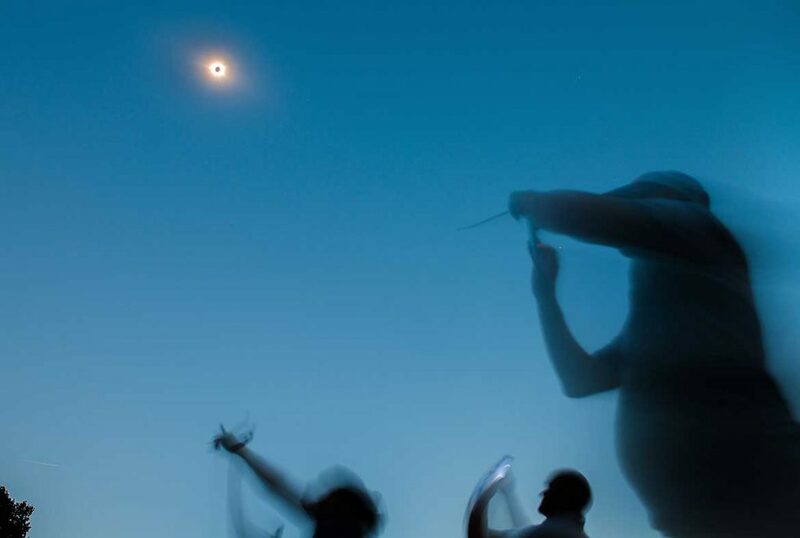 The crickets kept chirping, doing their best to outdo the now-ecstatic eclipse watchers gathered at Cedar Falls Park near Greenville, S.C. Over 800 people came to witness the 2017 “American” Eclipse that was visible across a 70-mile stretch of the contiguous United States. And in just two minutes, it was all over, and the crickets, confused by the sudden schedule change, kept chirping. 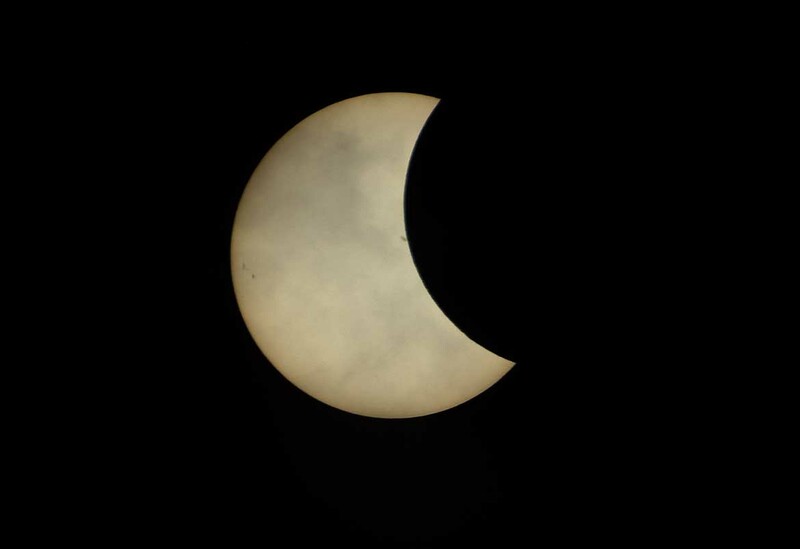 This was my first time photographing a solar eclipse. After more than 20 years working as a photojournalist –documenting all kinds of fast-paced events, including an Olympics and a variety of breaking news– I can now say that the two minutes making up “totality” match the intensity of these other venues. I spent weeks researching anything from the kind of equipment needed to practicing taking pictures of the sun through special solar filters in my backyard. I was unimpressed with my first test photos. I didn’t even capture so much as a sunspot – just a white, smooth ball, which when I showed it to one person, was confused for the moon. I then spent hours looking at maps to find a good location within the pathway of totality, and I dragged my empathetic wife and her siblings all over South Carolina scouting out locations the weekend before this rare solar event. Working for Uncharted means that I’m always looking for less popular, off-the-beaten-path locations where likeminded people go to avoid the crowd. That’s why we exist – to make exploration of these lesser-known places easier. And while I was certain crowds would find me wherever I went on this rare occasion, I still wanted to position myself at the kind of place our “explorers,” the members of our growing online community, like to frequent. After visiting a state park and then a lake that turned out to be mostly privatized, and then a dike in a small college town, I returned to Greenville concerned that I still hadn’t found the right place. It was then that Laura Hansen, a resident of Greenville and my sister-in-law, suggested Cedar Falls Park located just 15 minutes from her home. I walked through the whole area and found two or three locations that I thought might work. I used an app called PhotoPills that positions a virtual sun using the phone’s camera so you can see exactly where the sun will be on any given day and time. I was as ready as I would ever be. 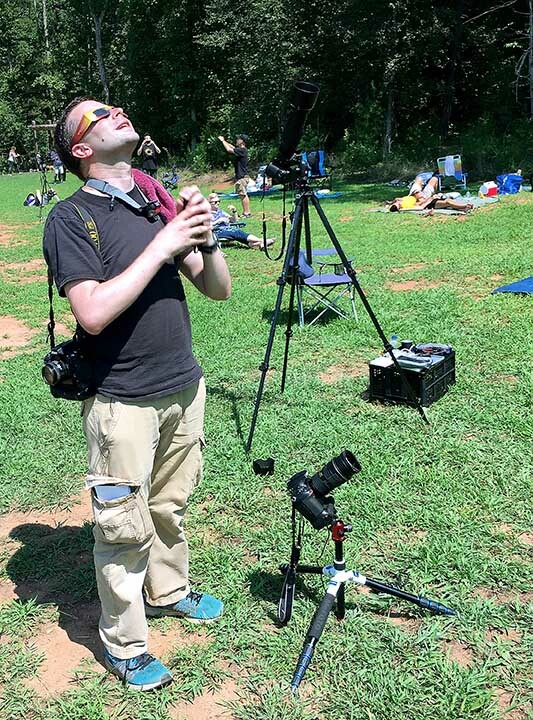 But there’s no amount of research, planning, and practice that can prepare you for the magnificence of this short, two-minute solar spectacle for which thousands transcend all kinds of obstacles to be present on that special day. Photos do not measure up to what can be seen with the naked eye. Video can’t quite capture the experience either. I now understand why so many people went to such extraordinary lengths to get inside the totality path. When we arrived at the park, there was a guy who had camped out overnight in his car with his young son just to beat the crowd – and he lived nearby. I also heard reports of fuel shortages in North Carolina. Before the eclipse, I admit I may have wondered about their sanity, but now I’m just like them. And as important as it is to prepare for covering any event, sometimes the best photojournalism lessons are learned by doing. And that’s exactly what happened to me. 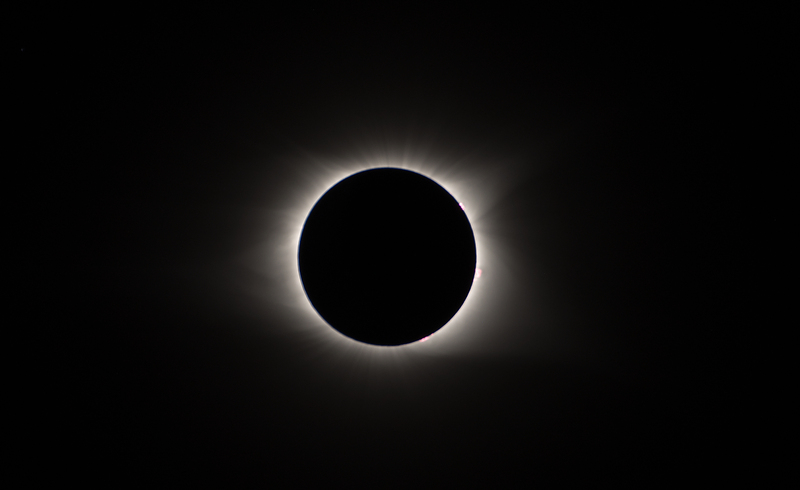 While I’m very pleased with the photos that I captured and the article written by Charles Geraci, here are a few thoughts on what I would do differently for my next eclipse since I’m now addicted and anticipate having to make eclipse stalking a regular part of my life. I used three Nikon Digital Single Lens Reflex (DSLR) cameras for this assignment and one GoPro device for video. 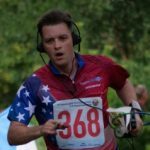 I also wore a digital recorder so I could capture the sounds that take place during totality. My attention was divided mostly between the two DSLR cameras– each connected to the same wireless remote. The third camera I wore on my shoulder, and I used it to capture eclipse watchers, unique shadows, and other common phenomena leading up to totality. While I was away from my tripod-mounted cameras, I could walk around and photograph people watching the eclipse and still take photos with the other cameras using the remote. But I spent most of my effort making sure the sun was centered in the frame of my 500mm lens and, despite the wireless remote, I was still tethered to that camera. If I could do things over, I would’ve asked someone to take over this job about 10 minutes before totality; this would allow me to focus my attention on using the other camera set up on a tripod with a wide angle lens to capture the people and scene during totality and to use the one around my neck to capture people watching the last moments of the partial phase. I thought I would have plenty of time to capture interesting phenomena such as the metallic shadows and crescent suns projected through pinholes in leaves, but there just wasn’t enough time to focus on this. 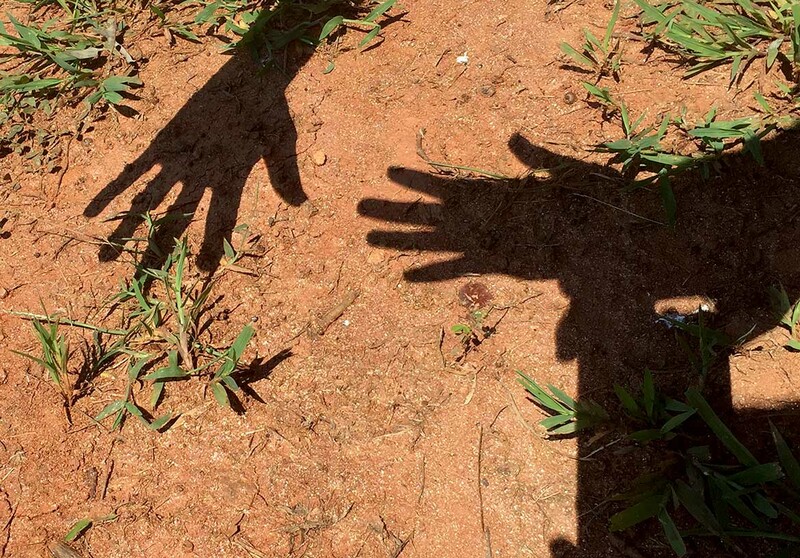 I asked one or two people to look for these things and snap photos with their phones and that helped, but next time, I’ll plan on having more people do this since I noticed how difficult it is for anyone involved to focus on anything but the sun. When covering any important, fast-paced event, the challenge is finding the balance between documenting it and enjoying the experience. While I did have moments where I could just relax and take in the beauty of the totality phase, I didn’t see as much as I could have if I had not been taking photos with four different cameras. I decided to use wireless remotes to trigger each camera because I wanted more control, but next time, at least during the totality phase, I would probably automate the photo taking with an intervalometer for at least one camera so I can enjoy the experience even more. 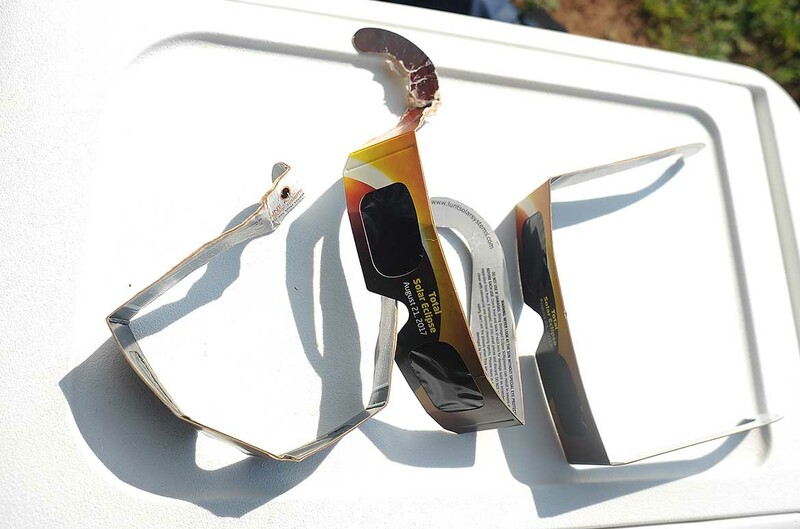 And perhaps the most important lesson I learned is to have extra eclipse glasses – not necessarily to give to the unfortunate person that forgot to bring his or her set, but for me. The cardboard frames on my glasses that came free with the solar filters I purchased from B&H are perfect for the normal eclipse viewer. But unlike most people, I was running back and forth from camera to camera, taking photos of people on one end of the field and running back. I frequently took off my glasses to manage equipment, and perhaps what was most deadly to these cardboard frames was sweat. I sweat so much that it looks like I spent all afternoon in a rainstorm – and that’s only after a few minutes! So the cardboard frames soon became saturated with sweat, making the frames so flimsy that they would’ve fallen apart had I not switched to a new pair – I went through three sets by the time it was all over. Next time I may invest in sturdier glasses or pick an Arctic location. Each situation is different, and it’s likely the circumstances for the next eclipse will be very different than what happened this year. For this reason, it’s important to remember that most plans become obsolete the moment they are written. Either way, I’m now an eclipse addict. Sign up for our latest updates as we work to make exploration easier. These are some extremely helpful tips, even for someone who isn’t a photographer. Thank you!! Thanks. If anyone has questions you are welcome to post them here.